Steel Making Plant: square billet and bloom. We provide services in Engineering, Procurement, Construction and Commissioning (EPCC) specialized in steel division. Our scope of supplies in steel making is to produce billet and bloom by continuous casting technology from scrap. For Steel Making Plant depending on capacity and electricity condition, selection of Induction Furnace (IF) and Electric Arc Furnace (EAF) can be done. Ladle Furnace (LF) selection to enhance metallurgical refining process for quality and productive production and finally an appropriate selection of Continuous Casting Machine produces defect free billet and bloom will be incorporated for a complete steel making plant. For Rolling mill Plant depending on shape and sizes and capacity of the customer requirement, an appropriate rolling mill will be integrated with the steel making division. Fully continuous straight rolling mill, semi-continuous mill, tandem mill, cross country mill, reversible mill or even universal mill can be integrated. Product range can be wire rod, deformed & round bar, angle bar, channel, H beam. Auxiliary Plant Another division that we are providing is auxiliary plant such as dust collecting plant, oxygen plant, water treatment plant, electrical power distribution plant etc. 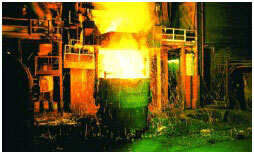 Steel Plant: Induction Furnace (IF), Electric Arc Furnace(EAF), Ladle Furnace (LF), Continuous Casting machine (CCM). Rolling Mill : Reheating Furnaces and walking beam reheating furnace, 3 Hi Roughing Mill, 2 Hi intermediate Mill, Horizontal vertical rolling mills, start-stop flying shear, product shear, cooling bed, auto stacking and bundling machine. Roll lathe, rolls notching machine etc. Components: rolls and guides, mill motors, roll neck bearings, universal shaft, gear and pinion boxes, furnace water cooled furnace roof, and furnace and induction transformers etc.